Metallica took over Bonnaroo last summer as all the other stages took a break to allow all to converge for the high energy storm of music. Metallica held back nothing, giving all to the 100,000 or so who crowded What Stage for the Bonnaroo headliner. I had the awesome opportunity of expericning the whole show from on the stage. At one point we had to move closer to the band because we were almost under the pyrotechniques. 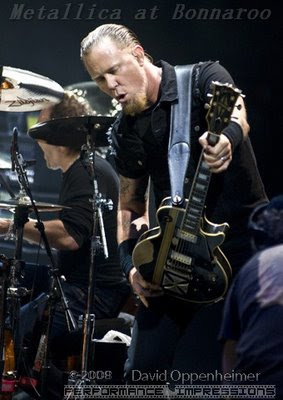 Visit the Metallica Photos with streaming audio and more Bonnaroo photos.